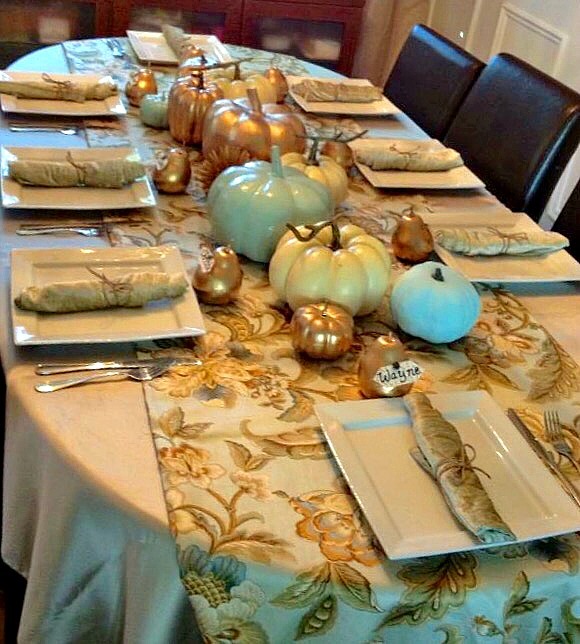 A Thanksgiving Tablescape might seem a bit early for my American readers, but for us Canadians, our thanksgiving is being celebrated this weekend. 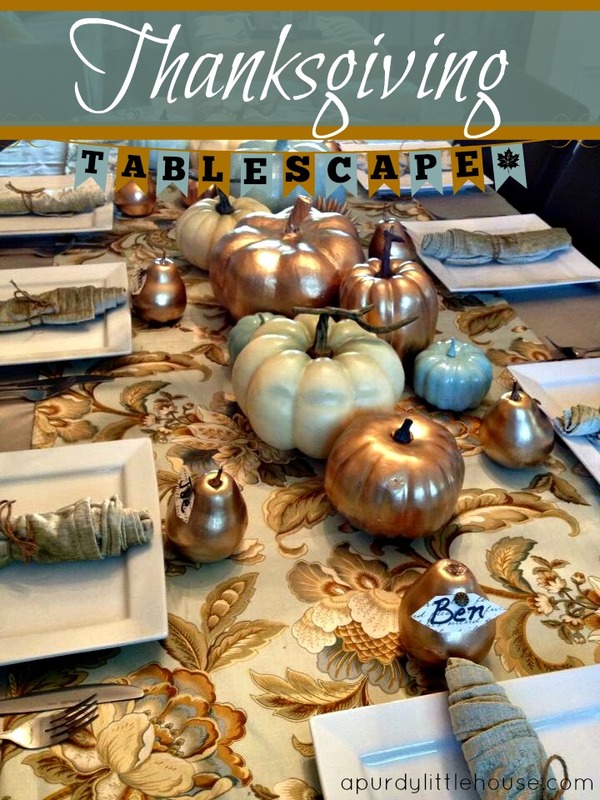 In this post, I’m going to show you two different variations of tablescapes I did using mostly the same common elements. Thanksgiving is one of my favourite holidays, since it’s all about gathering with loved ones and being thankful for everyone taking the time out of their busy schedules to come together. This particular tablescape was inspired by the pretty fabric runner. 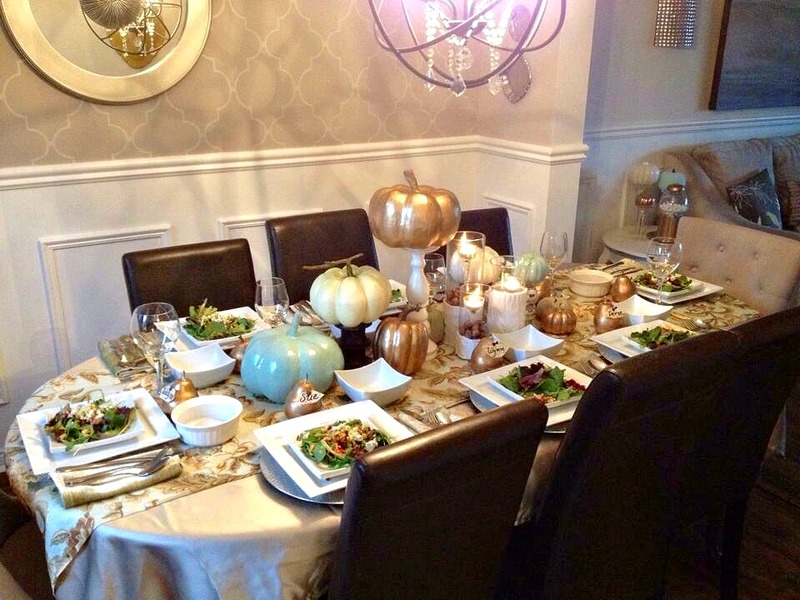 It’s gold shimmery tones and subtle greens and browns make this a lovely addition to my Thanksgiving table. 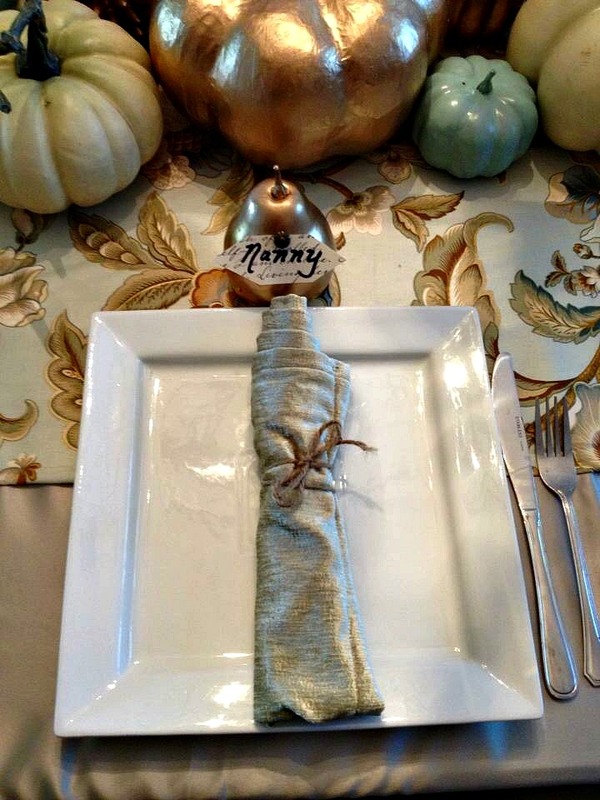 These chenille napkins in a soft green coordinate well with the green tones in the runner. For this table, I rolled and tied the napkins using jute twine to act as an informal napkin ring holder. The place cards were done using scrapbook paper, and tacked into place on a spray painted gold pear. I used an upholstery tack (because it’s more pretty than a plain tack). Here is the second tablescape I threw together, where I added several more elements to the table, including candles in vases wrapped in a cozy sweater. I also added variation in height to the pumpkins using candle holder. 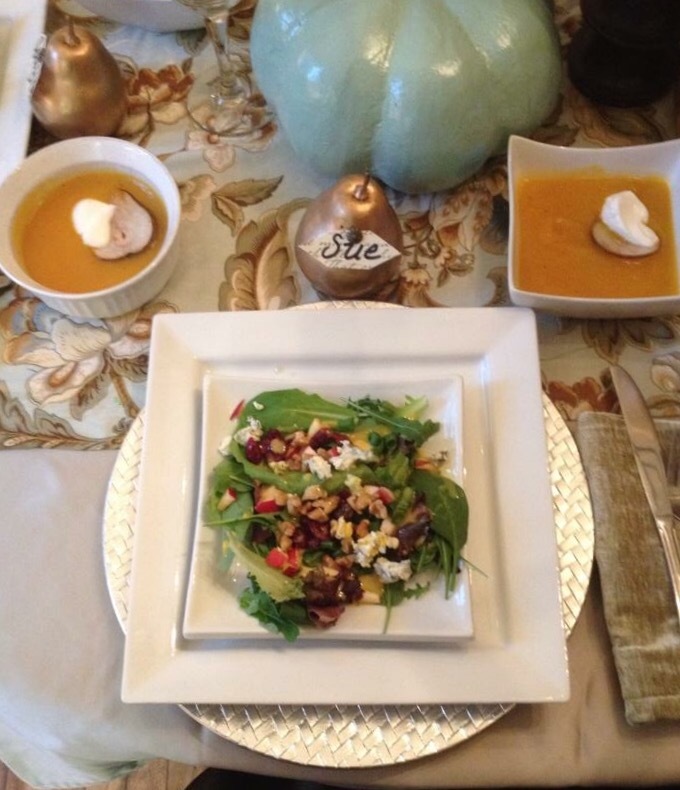 This meal was so much fun to put together, as it featured an appetizer of spring mix salad, topped with walnuts, apples, and blue cheese. The dressing was a homemade apple cider vinegar and honey mixture. Perfect for celebrating the autumn harvest. And so yummy…. 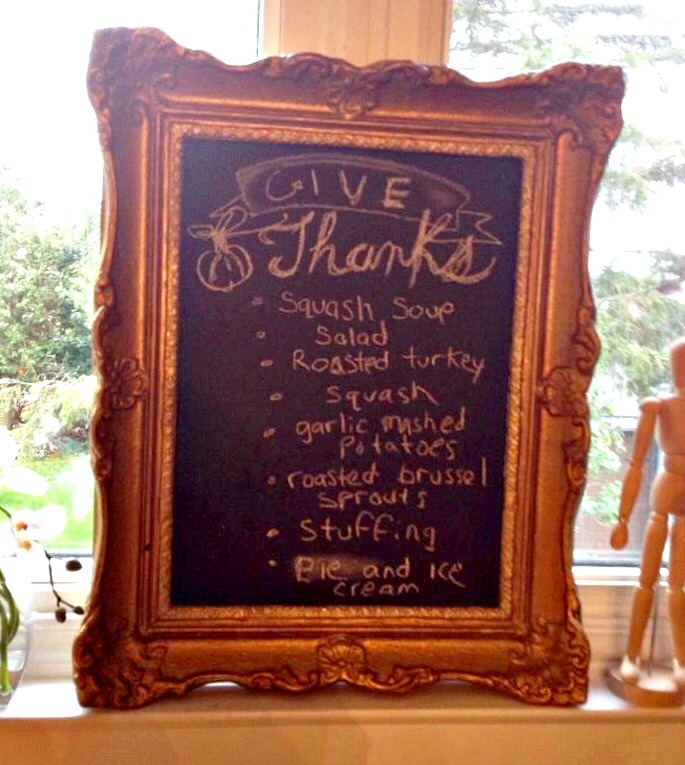 Not all courses were able to be added to the chalkboard, but I love this idea to use a chalkboard menu as decor. That’s it for my Thanksgiving tables. 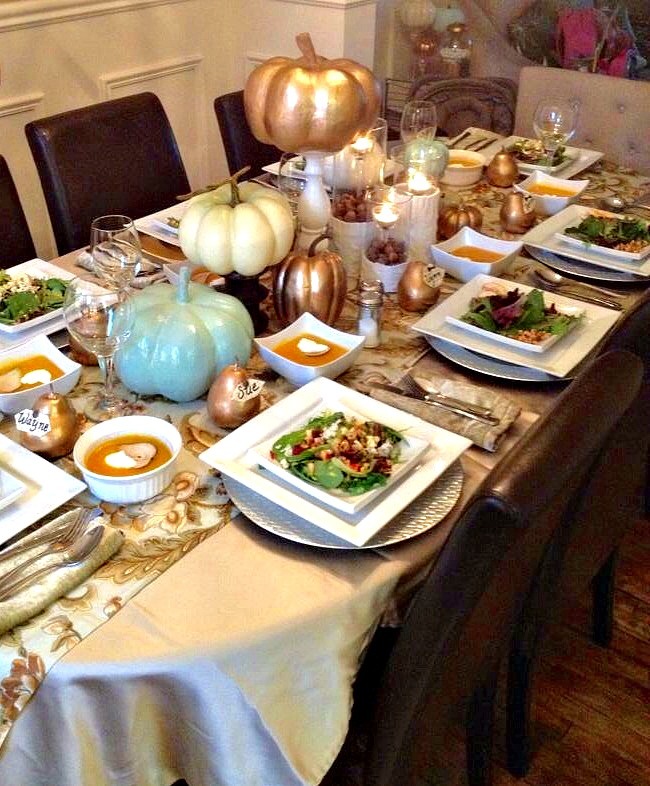 I hope all my Canadian readers have a wonderful holiday with friends and family, and don’t worry my American friends because I’ll be posting A TOTALLY NEW Thanksgiving tablescape especially for you guys once it gets closer to your holiday. Oh whew, glad it’s your Thanksgiving…I was starting to feel BEHIND. Lol. 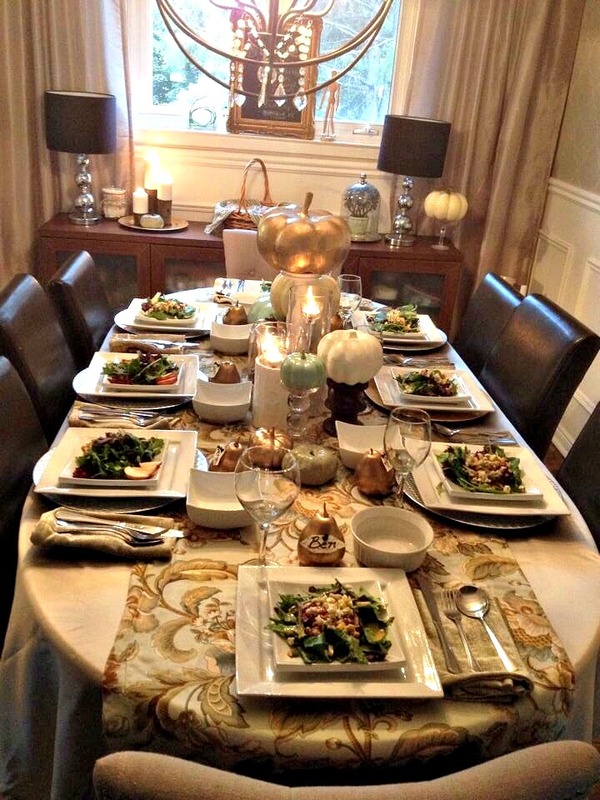 Your table looks beautiful (love your runner!) and the menu sounds delicious! Happy thanksgiving to you. I can’t wait to show my outdoor thanksgiving Tablescape. 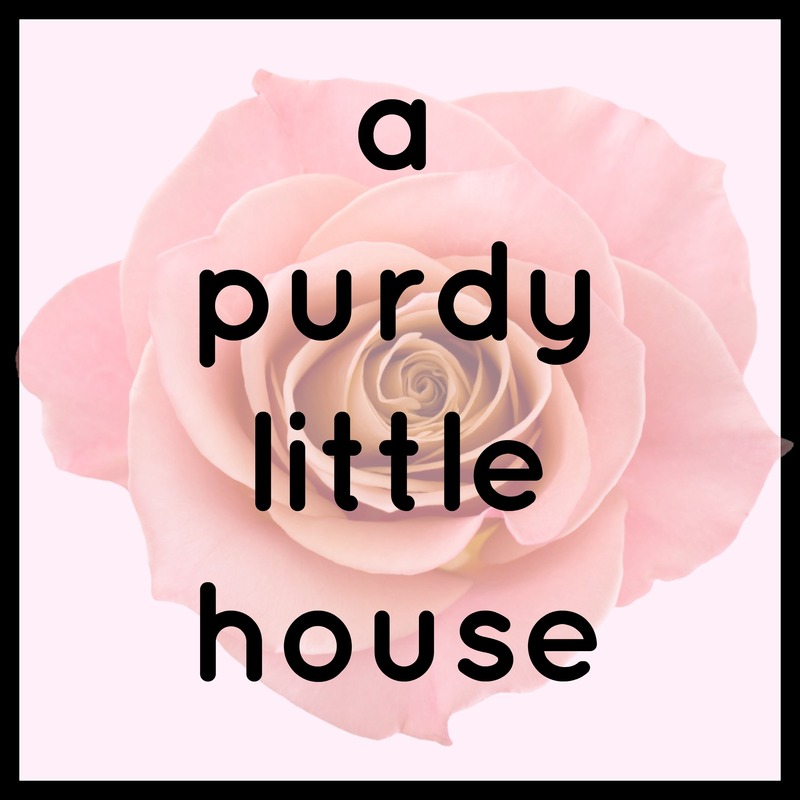 Hint: I’m planning to do a special post for the American thanksgiving with my first ever giveaway. Stay tuned, and thanks so much for your sweet comments. I always love to hear from you.